The valley was more scary; the time was around 7.30 pm; we all finished the dinner preparation yummy Khichadi; about to set for night camping; suddenly we can hear thunder sound continuously; the light was hashing us; a youngest trekker Kirtana [7 year old] started cry “wants to go home!! !”; we all set under the tarpaulin till midnight. This was the situation of the most scary trek night at Barapole river, near Kutiyala range of Virajapete taluk. Since I am become a member of Conservation Awareness Team Trust [CATT – www.catt.org.in] this was my first trek with Prathap Sikadar. 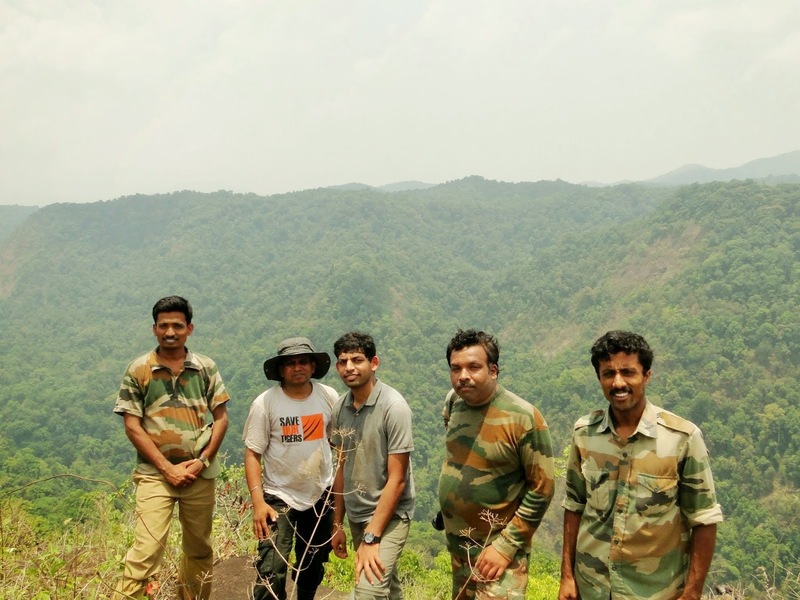 He organized many treks around Western Ghats and very surprise to know that he explored almost entire Western Ghats. The team size was only 5 members; the youngest trekker Kirtana joined with her father. We left the Bengaluru on 18th April 2014 at late night 11.30pm. The journey distance was around 250 kms. Boarded the Qualis from Shanthala Silk house, later Sri Ram & his daughter joined us at Raja Rajeshwari arch. Journey went on with self-introduction till midnight. 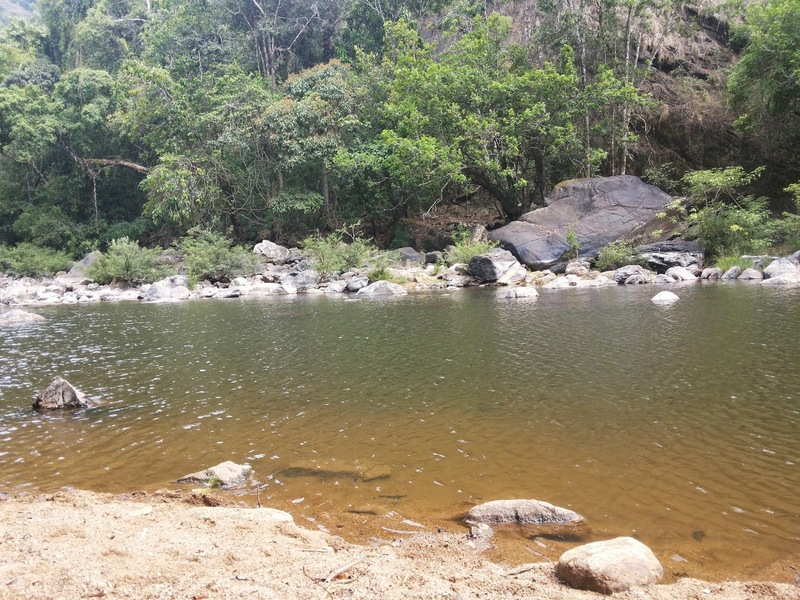 The base camp of this trek place is called Kutiyala Anti-Poaching Centre [APC] which was very remote place around Virajapete taluk. We all reached very early morning at 5 am to the APC. Babu in-charge of the camp greeted us with his smile. Finished our morning duties and Babu took us very beautiful place near to the camp. Finished our breakfast near the stream and did some good photography. 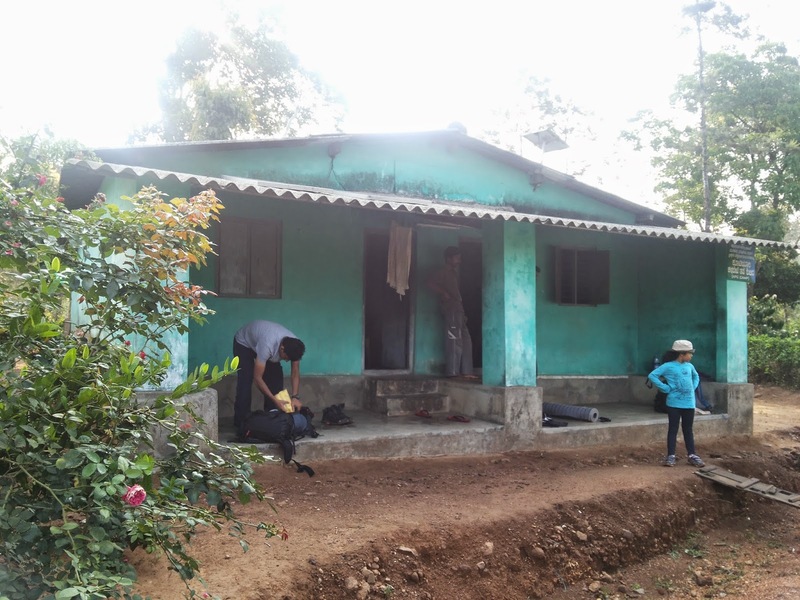 Back from the stream, we all set to leave towards Nanjigundi hills. Babu briefed about our journey and asked us to get prepare to fight with blood sucker leeches. Very surprised to know that in the April month still the leeches are active in this range. Took the group photograph and left for the trek with Gun and Macchu. May be surprise why the Gun!!!! The entire range is inhabited by Elephants. The initial a kilometer path was jeep track. Very soon we all entered in the forest. Crossed the Elephant trench and the path become denser. Started to notice leeches are crawling on our shoes. The little trekker never bothered about the leeches and very daring girl. After few kilometers trek reached a watcher tower. We all went up and enjoyed the entire valley. Took many photographs and headed towards the Barapole river. From watcher tower the path was descending; we have to be very cautious to get slipped into the valley. There was no defined trail across the stretch; literally we have to cut the plants and make the way. Enjoying the valley reached the Barapole river around 3 pm. The place was really beautiful and very scary. The civilization is far away from this place and to be very cautious about the animals. The stream was flowing calmly; one side of the river bank is big trees. Dumped our backpacks and decided to have the lunch. We all shared our lunch and enjoyed in the river. We had enough of the time and explored the place. The trek was more pleasant till 5.30 pm; suddenly clouds turned into black. Prathap suggested not taking risk will start the dinner preparation. We had no option apart from this; there was no shelter to escape from the rain. 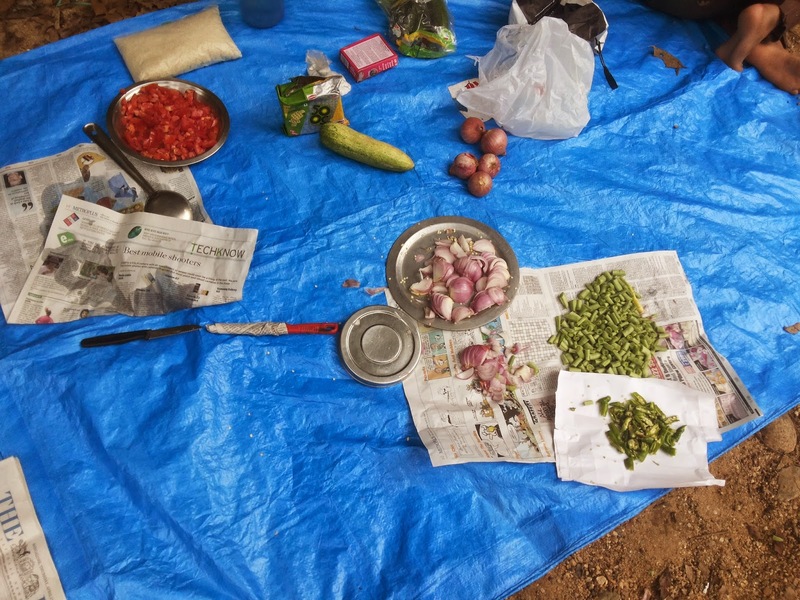 We all together helped Prathap in preparation of Khichadi. Yummy dinner ready and had very early at 6.30 pm. The entire valley becomes dark and very scary. About to settle for night camping suddenly the rain started. Luckily we carried two tarpaulins; one we covered our entire luggage and second one helped us to protect getting wet. Four of us hold the corners and rest settled under the tarpaulin. The thunder and lights made scarier the night. Kirtana started crying and asked her father to take him back. We all tried to convince her; still she did not. At last she got tiered and slept on her father lap. May be the time is around 12 midnight, the rain shown little mercy on us. Sky was become little clear and star started to shine. With great difficulty we all set to relax for some time. Dinu, one more forest watcher taken care about the fire. We have very thankful to him; entire night he was watching us holding the gun and keeping alive the fire. When I opened my eyes, the valley was looking more beautiful. The eyes were not ready believing the scary night situation. Everything was looking pleasant. Kirtana back to her trekking mood. Quickly finished our breakfast and left from the Barapole River. Ascending the part sweated us, taking multiple breaks reached back again the watcher tower. Leeches were again more active to attack on us since yesterday night rained. The view of the Barapole was looking more beautiful. The next point is to reach the Sharadabbi falls. Again soon we entered into dense forest. Dinu struggled to find the path. The sun rays were struggling to reach the earth; we can imagine the dense of the forest. The Sharadabbi falls was dry, Babu explained about the place and crowd during the monsoon. This falls is accessible by jeep. Spent good times and cleared litter. Taking many group and individual photographs finished our lunch. Now the time is back to base camp. This stretch was flat jeep track. Very soon we reached back to APC, left the place with mesmerizing our last scary night. Hats up to Kirtana who completed successfully the scary trek. “If you not dived in, then you have not lived in”; very true!!! The quote was written on “DREAMZ DIVING”SCUBA diving Instructors T-Shirts. Never thought I can dive in short span of time, of course it was one of my must to do list. I am very thankful to my lovely friend Suresh who invited, motivated and tempted me to do the diving. Sreeharsha Aithal & Suresh (Organizers) who constantly worked almost a month to get happen and it was very grand success. Heartiest congratulations to your skills and dedications guys!!! The preparation, planning and interaction were floating through mails, WtsAppandfacebook messenger. We 29 enthusiast divers assembled in Majestic on 4th April, 2014 at 7.30 pm. Bangalore traffic is the main reason to justify everyone being late; it was the same too few of friends. Highlight of the group is that my very good trek friend Shanthi Prasad was accompanied with his wife (brave couples). Appreciate the organizers skills hiring 45 seaterbus and engaging catering services for meals. Left the Bangalore around 10pm and two friends joined at Tumkur. Enough of empty seats made people sit comfortable and put the backpacks on the seats. Journey was quite uneasy as I am unable to sleep properly. Reached Murudeshwaraby 8.30 am. We have pre-booked 6 rooms in the KamatYatriNivas so it was smooth and quick us to get ready for diving. Running one hour late as per schedule and Sreeharsh was constantly in touch with the Dreamz Dive personnel about our arrival and further formalities. The hot hotpoori&Avalakki was ready and finished our breakfast. I have a very bad habit, before going to any trek/event I read the blogs. In all blogs everyone advised not to take heavy breakfast before going to diving. Controlled myself and took very less Avalakki. 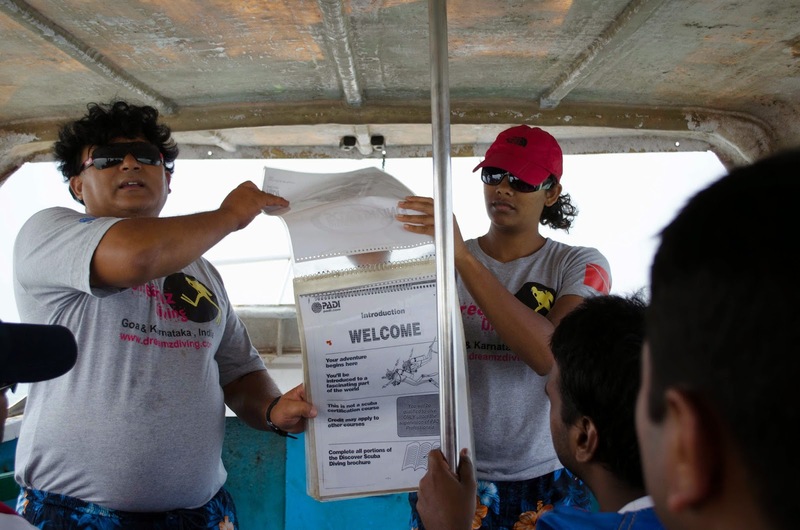 We all ready by 9.30am to board the boat which takes us to the spot of diving Nethrani Island. SCUBA full form is - Self-Contained Underwater Breathing Apparatus. Nethrani (Pigeon Island) is tiny island 20km off from the Murudeshwara. Dreamz Diving conduct the diving and other water sports activities (www.dreamzdiving.com). We have booked through them. 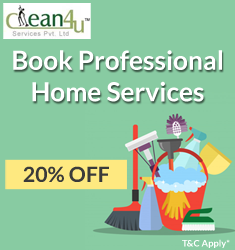 Booking process is, you have to contact them well in advance and should provide the identity proofs which required taking the permission from Local Police authorities and Indian Navy. Without these formalities you can’t do the dive. 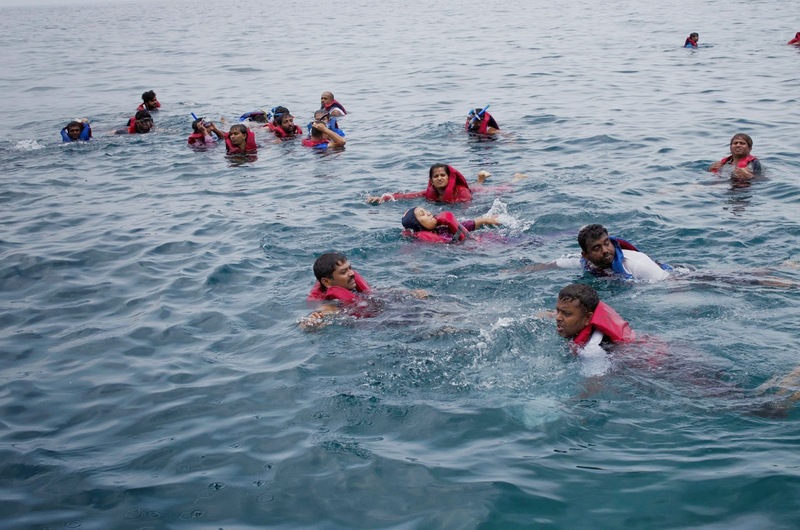 Our group is divided into two boats and unforgettable journey begin with wearing Life Jackets. 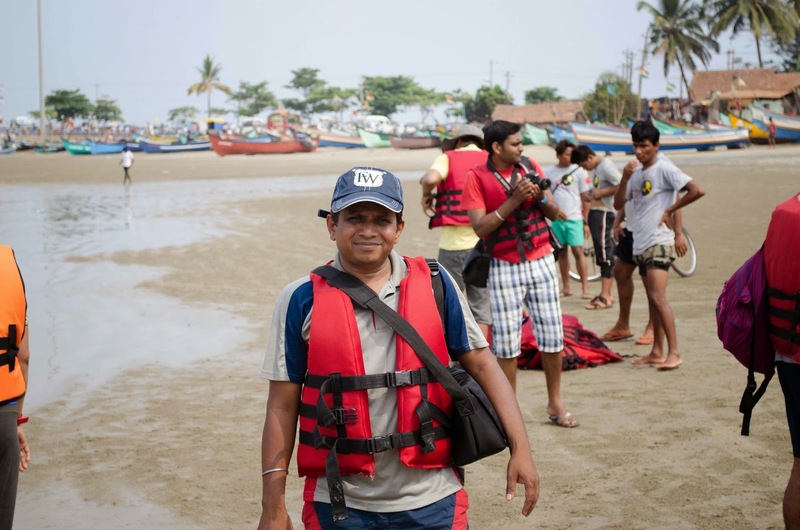 Luckily the Dreamz Dive founder Mr. Dhirendra Rawat was accompanied with us. He explained about the SCUBA diving, equipment, pre-caution measures, breathing techniques etc. Even we have been allowed to wore eye gear which thoroughly covered our eyes and nose. As long as we are away from the shore, people started to get the sea sickness. The whole boat friends were very quiet and can be hear only the engine’s sound. Everyone face was quite nervous including me, not sure whether we can dive it or not. Many of us vomited and very were very silent throughout till reach to Nethrani. The journey was almost more than an hour. 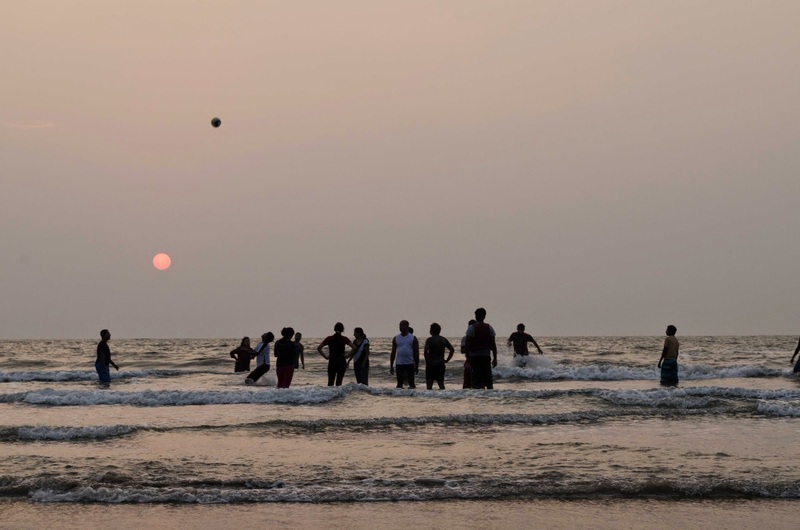 Nethrani is visible now and can see many people enjoying in the sea. There were multiple of boats where people diving. Each one of us asked to jump into sea. For a minute I too got scared by seeing the sea, getting the motivation from other friends jumped into water. Just could not believe myself and very next moment I was floating on the water. I know little swimming but never enjoyed the water with life jacket. Initially salt water of sea went into the nose and eyes got burning, however the real enjoyment begun. Everyone fear vanished and can see across all are floating and enjoying the sea. We have been provided the SNORKELING kit. It involves wearing a life-jacket and eye-gear. The life-jacket ensures you to float on water and the eye-gear ensures your eyes and nose is sealed. You wear a mouth-piece which has a tube coming up. So, you breathe thru' the mouth and although your face is submerged, you get air thru' the tube. Now everyone got confidence and beauty of undersea. 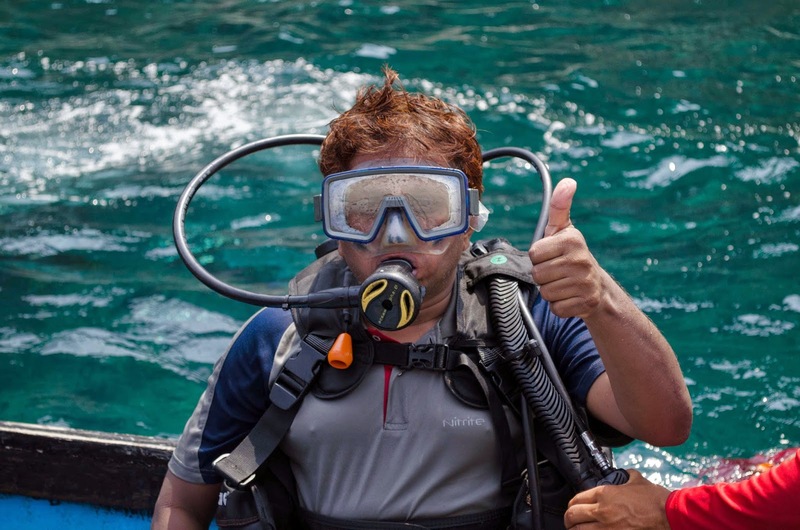 Its amazing experience and I am very confident about diving. 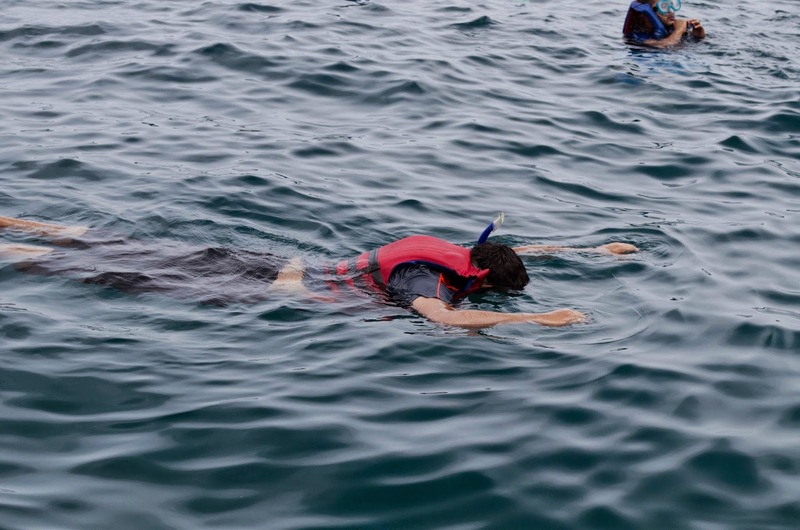 Snorkeling will make you more comfort and build the confidence level. 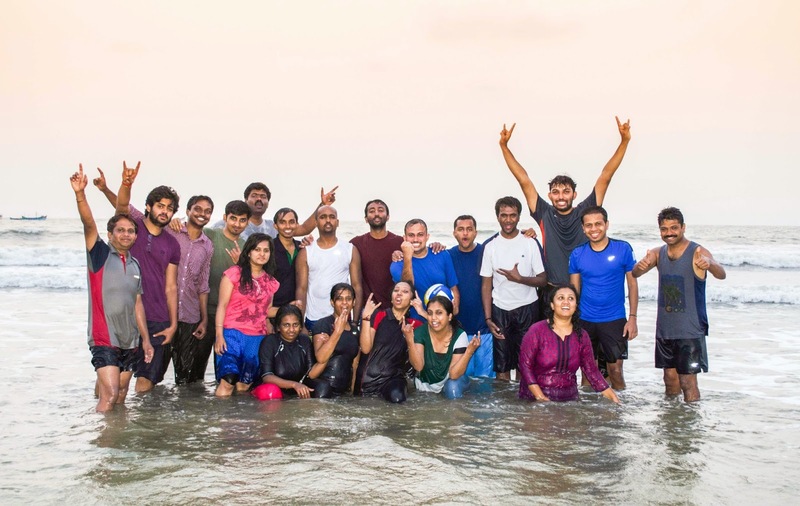 There were around 5 – 6 instructors who were taking us batch wise for diving.Few finished friends started to share their wonderful experience. Believe me I was not scared even a second and I eagerly waiting to my turn. Each of one of us to wore a BCD (Buoyancy Control Device) which controls our depth and our upward/downward movement. The air tank was loaded on to that and there was dry air filled at 200 psi in each tank. The weight of tank is approximately 40kgs. We wore eye gear which thoroughly covered our eyes and nose; the eyes and nose were completely sealed so that water should not enter inside. Need to breathe through our mouth. We wore a pair of fins on the feet. We all dived in our regular T-shirt/shorts.Each dive was about 30mins. They tied the tank on my back; just they pushed me into water. Once again he briefed about me sign languages and asked me to inform whenever I am uneasy. Now my great journey begins;within a minute am into another world. I can’t express the happiness, beauty and feelings in my words; the whole underwater world is so beautiful. Every minute he was asking me about my comfort and taking me deeper and deeper. As per them the deep of dive is around 40 - 50feet. I was feeling like enjoying a big aquarium. Saw varieties of fishes and other marine life. Instructor completely took me through different underwater places and asked me to land on the base. Turned me around can see many other divers floating above me. If you ask me to say experience in a word “simply super and amazing underwater experience which I can’t explain”. It’s true 30minutes different world. After finishing everyone dive, started to enjoy the snorkeling, different their own dive in the sea. We never expected that can enjoy lot. Dreamz Dive provides the snacks and drinking water on boat which contain Fruits, Chips, and Energy Drinks etc. Few of us took rest after the dive and rest people enjoyed into the sea. Its first time in my life, I was in the sea from morning 9 am to till 6pm. Now it’s the time to move back Murudeshwara shore. All friends were exchanging their unforgettable experience and busy to pose for photography. The journey was entirely opposite and now friends are more delighted. Reached shore around 5.30pm and rushed to room for a small break. Now guys are interested to enjoy the beach. We all have enjoyed wonderful beach volleyball, water motor bike. Whole day was in sea and am so happy. Returned back to room and get refreshed. By the time hot Bajji&Coffee ready, finished the snacks and went to Murudeshwara Temple. Finished the pray and had leisure walk around the temple. Never seen anyone is feeling tiered and still people exchanging their wonderful diving. Finished the dinner around 9.30pm. We did not want to miss the beach night walk, so I, Abhishek and Shanthi Prasad went to beach walk. Relaxed sometime on sand. Cool breeze and the waves refreshing the SCUBA memories and motivating me to do more diving in future. I could not able to sleep properly and woke up by 4.00 am. My other buddies were in deep sleep and did not like to disturb them. Got refreshed so early went for a walk. The city was still in sleep and few were in the morning jog. Went alone to beach and inhaled the fresh air. Returned to room by 5 am and Shanthi Prasad is ready for morning walk. Again we both went to beach and enjoyed the morning walk. Today the itineraries are casual and wanted to utilize the day. Finished the breakfast and left the Murudeshwara by 9.00 am. Next destination is YANA. Reached Yaana around 12 Noon. Around 2km trek from the tar road. Many times I was around Yaana but never had opportunity visit this place. It was casual walk and the place is really very beautiful. Finished the lunch and our next journey is towards Banavasi. On the way we visited the SahasraLinga (1000 Shivalinga’s) where Shalmala river flow. Due to summer, water level was very less. 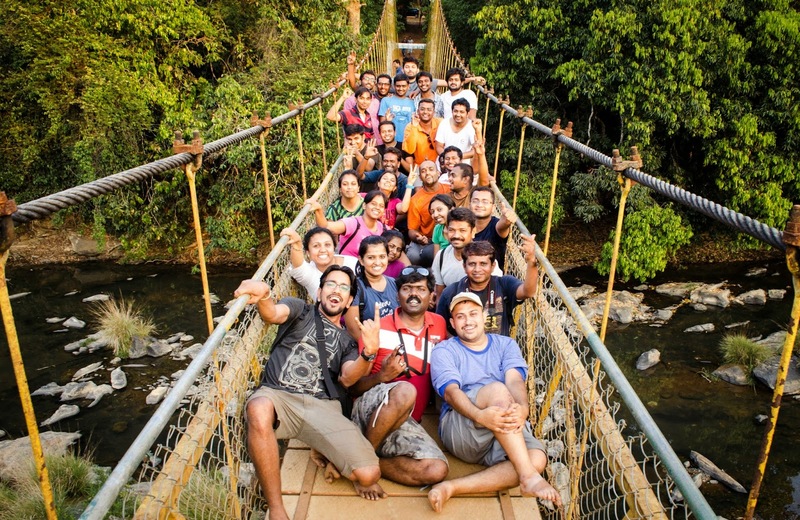 We had good group photo session on hanging bridge. Reached Banavasi at 8.00pm. The temple was decorated on eve of annual festival. Catering guys were busy in preparation of Dinner. Now the time to turn back to Bangalore. Left the Banavasi at 10pm and now the interesting part begin. I was thinking why this group is not interested in the Songs, it turned false. The Antaksharijugalbandi went on till mid-night. Rocking guys and came out many hidden talents. Both teams were performed excellent!!!! Vivek Bhat is performed the songs with his action!!! Unforgettable journey!!! Our target to reach Bangalore is at least by 7.00am; it happened. Adieu to everyone, remembering the life time moment finished the most amazing SCUBA dive. Special Thanks to Suressh & Sreeharsha organizing and giving me opportunity to be part of this wonderful team.